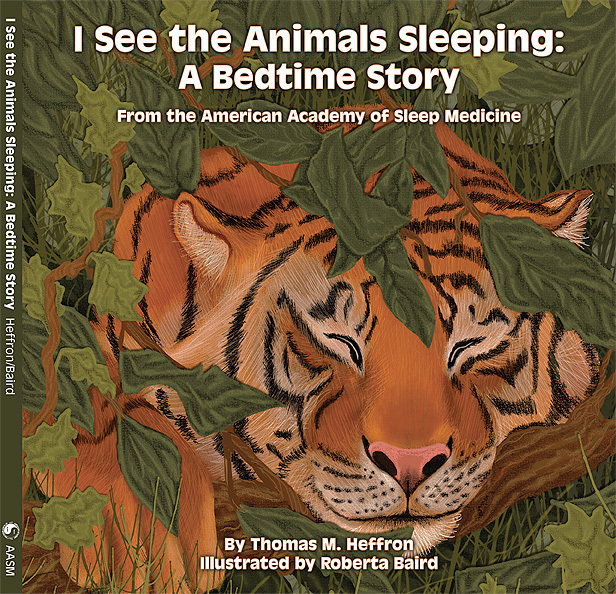 From the American Academy of Sleep Medicine, I See the Animals Sleeping: A Bedtime Story emphasizes the importance of sleep for both animals and children. With simple rhyming text and vibrant illustrations, this beautiful picture book highlights the diverse and fascinating sleep habits of animals. Some sleep hidden away in burrows and dens, while others doze out in the open. Standing up, lying down, in a tree, on the water – animals are sleeping in many different ways and in a variety of locations! Children will love seeing familiar animals such as a tiger, fox and giraffe. They will also be fascinated by more unusual creatures like a platypus and sloth. Each sleeping animal is brought to life in a richly detailed illustration that will capture the attention of children and spark their imagination. Interesting Sleep Facts also are provided to teach children about the different sleep habits of all the animals in the book. 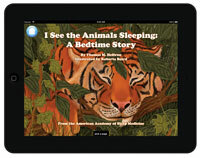 I See the Animals Sleeping: A Bedtime Story will encourage children to crawl into bed so that they can sleep too. Additional information about children and sleep is provided in A Note to Parents. Printed in the USA. Also available as a free App!